I reviewed the A side of this 45 quite awhile ago but have received a number of requests for the B side, so here it is in all its non charting glory. 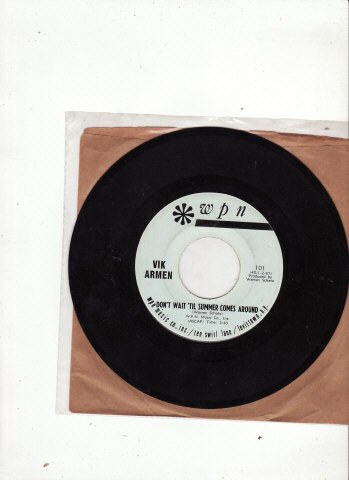 Vik Armen was a Disc Jockey for WPRO in Providence R.I. during the late sixties if my memory is correct. He released “The Girl Who Never Smiled” as a single and it received airplay in Rhode Island but quickly disappeared. “Don’t Wait ‘Til Summer Comes Around” was the flip side and it was a gentle ode to summer. Armen’s voice was laid back and not the strongest but he did a fine job on this single. It was released on the WPN label at Ten Swirl Lane, Levittown, N.Y. It was number 101 and I don’t know if there was ever a 102. Vic Armen returned to Canada and I think is still working as a dee jay, leaving behind this New England artifact. This entry was posted on Saturday, July 24th, 2010 at 11:35 pm and is filed under Small Record Reviews: The 45. You can follow any responses to this entry through the RSS 2.0 feed. Both comments and pings are currently closed.